Similar treats may be substituted. 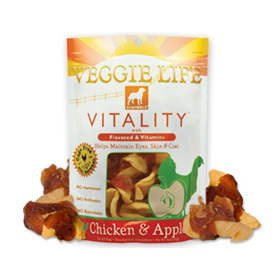 VEGGIE LIFE is a new line of products featuring sweet potato chews, sweet potato fries, and chicken wrapped around banana, apple and sweet potato.Try it in our HAPPY HIPS and VITALITY formulas.Dogs are going crazy for these healthy treats!Our clients are buying multiple bags a month! 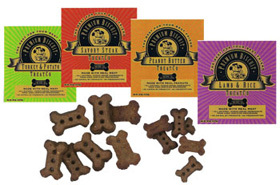 Treat your dog to 100% all-natural chicken breast wrapped around nutritious and delicious banana.Treats are fortified with Glucosamine and Chondroitin to help maintain healthy hips and joints. Call us old fashioned but we like the old days. 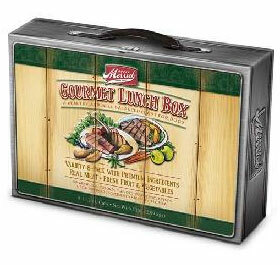 We’re talking about the old school lunch boxes that mom used to pack every day as she sent us off to school. This was the day way before manufactured; over processed pre-packed blah blah became the standard fare in the lunch room. We miss the TLC and home cooked goodness that used to come in our lunch boxes when we went to school or work. Merrick decided to do something about it and throw back to the days of black and white TV, fresh squeezed lemonade and homemade chocolate cookies after school. They’ve packed up Grammy’s home cooked memories in 8 delicious meals without all of the artificial preservatives, flavors and colors and packed them in a sweet lunch box to reminisce the days of our youth. So pick up a couple and give them to friends, family and let’s start a lunch box revolution. These products were created to be Comfort For the Soul? We hope these meals warm your dog’s tummy but we can’t guarantee straight A’s on his next report card. Meaty knuckles….. every pets dream! 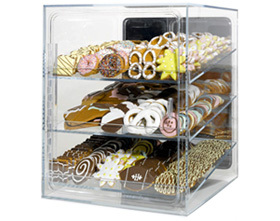 Our bakery case of dog treats speak of our deep passion in providing our customers the highest quality of decoration cookie after cookie. The smell of peanut butter dough drenched in delicious yogurt will have their taste buds tingling, and the sight of rich carob dripping will have their mouth watering, and the infamous pouty eyes will look up and you and beg for at least one ‘Pawsitively Gourmet’ specialty cookie! These products are more than a treat, they are an experience. Dogs love meat. That’s why TreatCo uses real meat…no meat by-products or meal-based ingredients. 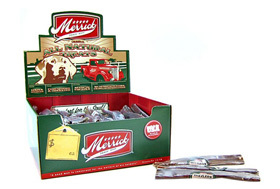 They buy their ingredients from USDA certified processors and leave out unnatural additives and preservatives. Made in two different size chews.